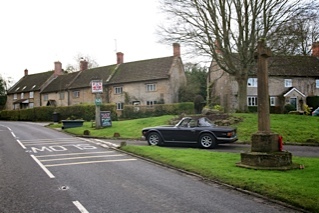 The Manor Arms, the only pub in the village, has always been a place of great attraction. This lovely old village pub has withstood the ravages of modern design. The blue flagstone floors will still remain the same. Looking back over the years there are a few changes. The pub could be entered by a separate door from the outside to the top bar. To move from the best bar to the top bar from inside meant lifting up a section of the counter which was only allowed on special occasions. Behind the counter stood wooden barrels on a jib of beer and cider with their wooden taps which seemed to squeak at every turn. Draught beer could be bought at sixpence a pint, whisky sevenpence a nip and brandy bought at so much a noggin. Bottles of home brewed beer and Hunstman stout were taken straight out of the crates. The attractive sign bearing the Hoskyns Crest and family motto: "Finem Respice" which means "Look towards the end" hung on the outside wall until 1956. It was quite evident by then that all cattle lorries and furniture vans had been built much higher and the angle iron standing out carrying the sign was being continually bent back, and having to be repaired. Co-op vans and double decker sheep lorries became even broader and higher and seemed to look out and say "Get Back!". One fine morning it was discovered that the sign had received a real knock and was hanging precariously from its bracket by one chain. "This is enough! ", said Colonel Macleod, the agent who had been appointed to follow Mr Raper in 1950. So the sign was taken down by George Toms and his merry men, John Diaper and Alec Eglon, all estate workers, and mounted on a wooden pillar in a much safer place on the edge of the village green, its present position. The beautiful sign in its ornamental iron frame is now crowned by the word "Food"! Most of the customers were locals who spent their evenings drinking while playing dominoes, shove halfpenny, table billiards and cards. Women hardly ever went inside the bar, but often fetched drink from the jug and bottle department. They never smoked. The pub closed sharp at 10 o'clock and quite often the village policeman was outside. The landlord, Mr Hallett was called "Buster". He drove a high spring trap and his pony, a very unpredictable sort, often refused to move off in the right direction. Harry Male, an old pensioner living across the road, often came to his assistance with a pat on its neck; to be led a few steps was all that was needed and away it trotted merrily. We have been unable to contact Mr Parkman's family to gain permission to use this snippet from what is an excellent book, and we are most grateful for the information provided. We will of course gladly post any credits due here if required.